Hyacinthe Rigaud (Perpignan, 1659 - Paris, 1743) was a French Baroque Era painter and draftsman. Rigaud studied in Montpellier and Lyon before arriving in Paris in 1681. He won the Prix de Rome in 1682. He was elected to the Académie Royale as a history painter in 1700. 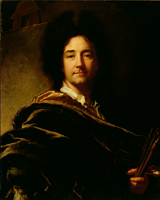 Rigaud was the leading portraitist at the court of Louis XIV during the latter half of his reign. Rigaud's paintings show a precise record of French contemporary fashions. Jean le Juge and His Family, 1699.